Part of being Catholic Christians is that we must help one another in many ways especially giving. Next month I have to pay the bills for this domain and other services and I need your help. Like the widow today who gave what she had, I ask you to imitate her by helping me continue this work and expand it. Donate to my campaign at www.gofundme.com/sacerdotus. God will see this and reward you for helping. Thanks. Today's readings remind us to be humble and simple. What the poor gives is greater than what the rich can ever offer. In the first reading, we read of Elijah the great prophet. He enters Zarephath and runs into a widow. He calls out to her to bring him some water and bread. She quickly goes to get him some. However, she does not have enough flour and oil to make bread. She was saving it for her son and herself. The writer emphasizes this because of the culture. Women at the time were not allowed to have property or work. Some cultures in today's world still have this way of living. The fact that this woman was a widow and that she had a little flour and oil for her son and herself shows her struggle after losing her husband. The husband was the 'bread winner.' However, with his absence, she has no source of income or wealth to care for herself or her son. Despite knowing this, Elijah still insists on the bread. However, he tells her, "Do not be afraid. Go and do as you propose. But first make me a little cake and bring it to me. Then you can prepare something for yourself and your son. For the LORD, the God of Israel, says,'The jar of flour shall not go empty, nor the jug of oil run dry, until the day when the LORD sends rain upon the earth.'" This widow immediately did as Elijah instructed without question. Because of her faith, she had enough to feed herself and her son for a year. God took care of her (Psalm 68:5). This connects to the Gospel and shows us why we must trust God and praise Him as the Psalm today calls for. God keeps faith forever. What does this mean? It means that He is always there for us (1 Corinthians 1:9). He will not abandon us. God is just and protects the oppressed like the widow we read of in the first reading (Deuteronomy 10:18). God cares for all, the blind, the dead, those who are humiliated. He loves the just and is there to protect the stranger. As we read, He protects and sustains the widow and stops the wicked. We must praise God and thank Him always (Psalm 106:1). We are in the month of November which in the United States of America is dedicated to giving thanks to God on Thanksgiving Day. However, we must thank God all the time. Luckily, we have Jesus Christ who is our connection to God, Father, Son and Holy Spirit as we read in the second reading. Jesus is God. He is also our high priest who plead for us and sacrificed Himself for us (Hebrews 4:14-16). The reading tells us that Jesus "did not enter into a sanctuary made by hands, a copy of the true one." This is in references to the temple built by Herod which was a copy of the Temple of Solomon (John 2:20). Moreover, the verse reminds us that temples, synagogues, churches are just buildings made by human hands. It is God who blesses them and gives them importance via His presence (Ezekiel 10, 2 Chronicles 5:14). A Catholic church building may be beautiful with ornate decorations, images etc; however, it is useless without the Holy Eucharist; the presence of Christ Himself (1 Corinthians 10:16)! This reading reminds us that Christ is with us. He suffered for us and died once for us (Hebrews 9:28, 1 Peter 3:18). The reading also reminds us that human beings die once and are judged. We do not reincarnate nor do we become angels. Human beings are conceived, live and die. They remain human entities. As an atheist studying reincarnation in Hinduism and Buddhism, the idea did not register logically to me. If we come back over and over in order to reach perfection, then which personality actually reaches perfection? Moreover, how can a soul reach perfection if it starts a new life with new experiences and does not have knowledge of mistakes in "past lives?" These are just some of the problems I saw with the idea of reincarnation. The Christian idea of dying once and facing God after death made more sense. This is why we must take advantage of this one life that we have and do our best. We must live each day as if it were our last, as the saying goes (Ecclesiastes 9:1-12). A video game comes to mind in this regard. In video games such as PacMan or Super Mario bros, the character has a set of lives. The more the lives, the more careless a player playing the game is. However, if his or her character has only one life left in the game, then he or she will be more careful so as to not lose the game. We should have a similar mentality in life. We only have one, so we must make the best of it by avoiding sin and 'losing' our life by condemning ourselves to hell or permanent separation from God. Our lives must be humble, doing small things with lots of love as Blessed Mother Teresa said. We see this in the Gospel which connects with the first reading. In the Gospel, we read that Jesus is teaching the crowds. He warns the people saying, "Beware of the scribes, who like to go around in long robes and accept greetings in the marketplaces, seats of honor in synagogues, and places of honor at banquets. They devour the houses of widows and, as a pretext recite lengthy prayers. They will receive a very severe condemnation." This verse is unfortunately used to attack priests and Catholics who pray the Rosary. However, Jesus was clearly speaking about the scribes and Pharisees. He was making a point that these people dressed the part and did the prayers but out of vanity, not for the real reason (Matthew 6:5). However, this does not mean that some of us in the Church do not do similar things. Many times there may be priests who celebrate Mass simply as a ritual that needs to be done. They focus on the wording more than the spirit of the wording. Vestments become things that 'dignify' the priest instead of representing the high priest Christ. Some lay people may pray Rosaries without even focusing on what they are saying. All that is heard is a mumbling of words without any substance behind them. We must not be like this. A priest should say Mass recalling what it really is. He must use vestments not to look 'pretty,' but to remind himself and the people who He represents. This is why Pope Francis has made it a mission to tone down the ornate decorum. We cannot be in a Church thinking we are royals that deserve praise and veneration from the world. Moreover, when we pray Rosaries, chaplets, litanies etc, we must really think about what we are saying (Matthew 6:5-15). The Rosary is the life of Christ and Mary. It is not an incantation that we recite mindlessly. In light of this, we must be sincere. Jesus reminds us in the Gospel that we must be like the poor widow who had little (2 mites - Lepton) but gave a lot. These mites were worth about half a penny which is a cent. 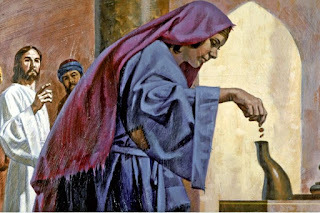 Some believe the phrase, "Putting my 2 cents in" comes from the story of the widow. A rich person can give 10 dollars out of his or her $1 million dollar salary to charity thinking it was a big deal, but in reality it is not. In contrast, a poor man or woman who gives 2 quarters he or she got from begging to charity and he or she gave a lot because it was all he or she had. God sees this and puts more value to this giving because the person gave all he or she had, showing that he or she is detached from material wealth and trusts in God. The Gospel reminds us that the lowly widow's actions trump that of the hypocritical religious person. Let us be like the widow and give to others even when we have little. Let us be humble like she was practice true and sincere religion that trusts in God and does not seek to promote the self. May Jesus be praised.